Welcome to the first Wonderful Wednesday challenge for July and we hope you can play along!! As always....it's ANYTHING GOES!! Break out your Kraftin' Kimmie Stamps and get krafty!! We want EVERYONE to be able to play along so your submission can use ANY stamp and can be any theme, any style, any design and it can be a card, a scrapbook page, an altered item....you name it!!... It must be a NEW creation and you can enter on this post until July 8th at midnight! At the end of the month one random winner will be chosen from all the submissions for the whole month and will receive a $20 Gift Card to the shop!!! What do you think.....wanna WIN?? Let's see your krafty stuff!! Here is this week's Wonderful Wednesday inspiration to get you kraftin', thanks to our fabulous Krafty Girls and Guests!! Then....let's see YOUR kreations!! 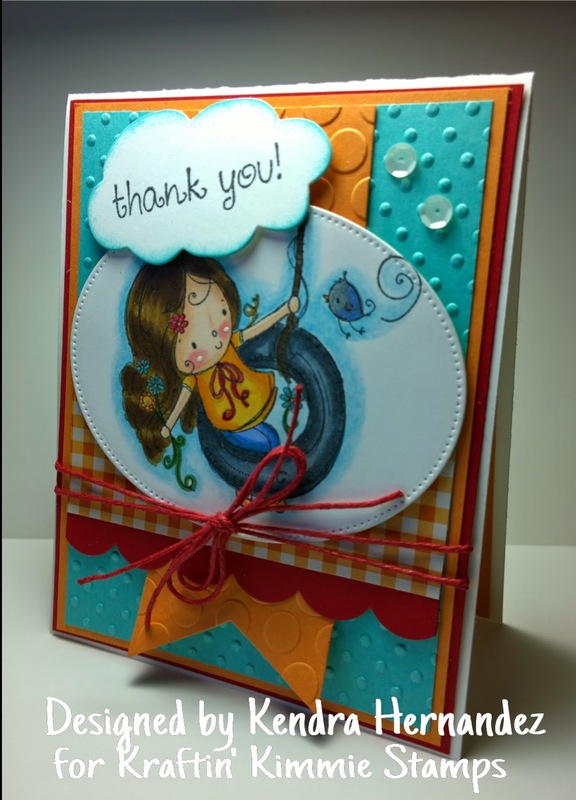 I used Kraftin' Kimmie's Summer Swingin' - I love this set - so cute and so much fun to color! !